Last Friday, March 15, we went to see the beautiful garden at Ferrari-Carano Estate Winery in Dry Creek Valley. They have a tulip and daffodil display each spring, and the tulips were in peak bloom when we went. 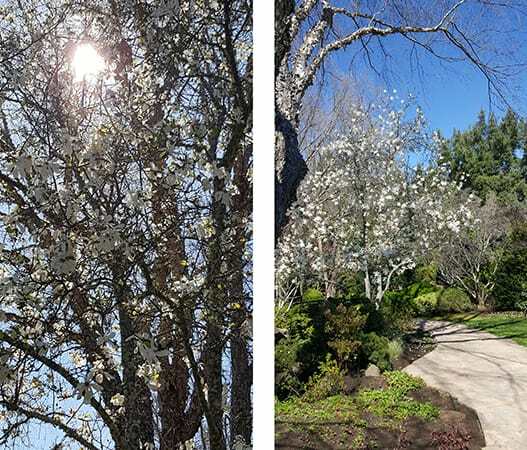 Spring is an especially nice time to visit because they also have many flowering shrubs and trees in bloom, but the gardens are designed to provide interest throughout the year. View from patio outside the Villa Fiore Tasting Bar. 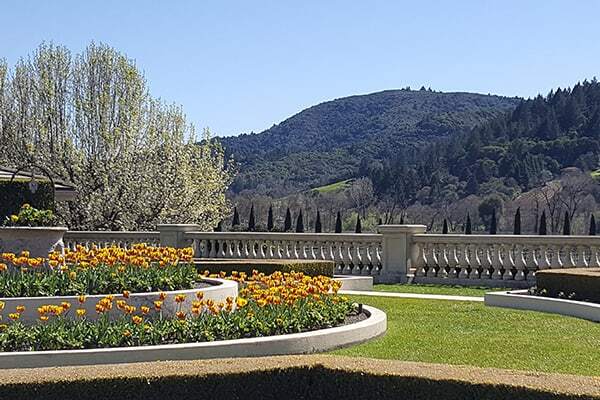 Ferrari-Carano offers red and white wines that you can try at their Villa Fiore Tasting Bar, which overlooks some of their picturesque vineyards and is surrounded by the garden. 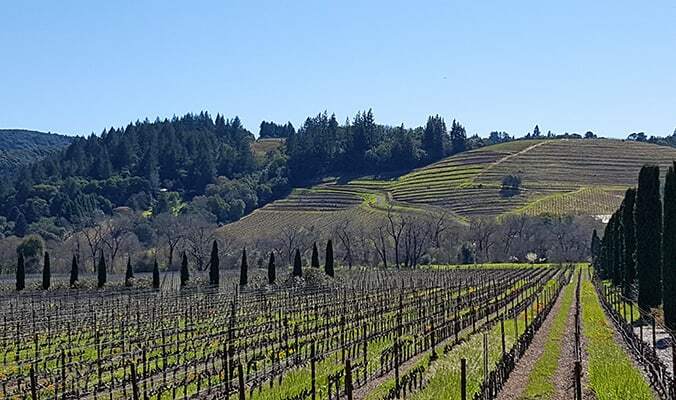 The brand owns vineyards in multiple locations, including Alexander Valley, Dry Creek Valley, Russian River Valley, Napa Carneros, and Mendicino Ridge/Anderson Valley. 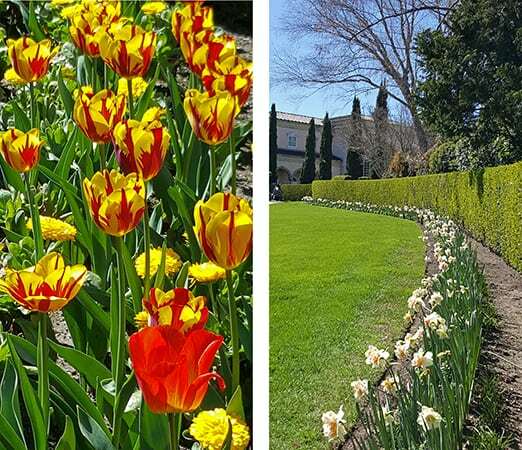 Vibrant yellow tulips with red markings were planted in the beds by the tasting room, and pastel peachy pink double daffodils were planted along a long bed that follows the main entry path through the garden. 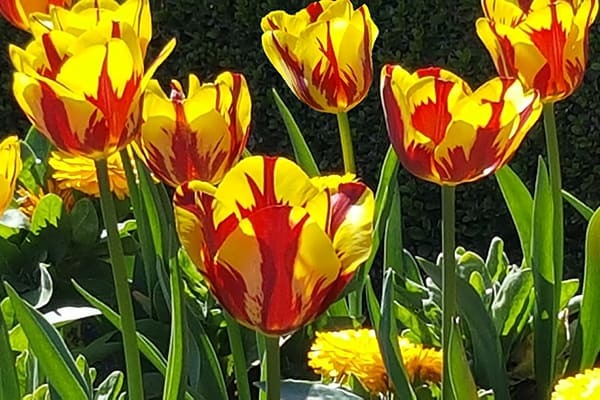 Different color schemes are chosen each year for the tulips and daffodils. The garden at Ferrari-Carano, created by Rhonda Carano and head gardener Pat Patin, spreads out over five acres and includes formal beds, a winding stream with a pond and waterfall, dramatic views, a large formal fountain, a shade garden, and paved paths that take you from one area to another. 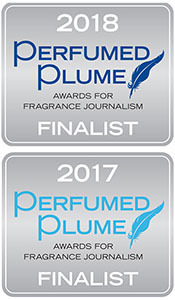 On one path, I kept wondering what smelled so good, and I realized that the scent was wafting from a star magnolia tree in full bloom with clouds of fluffy white. 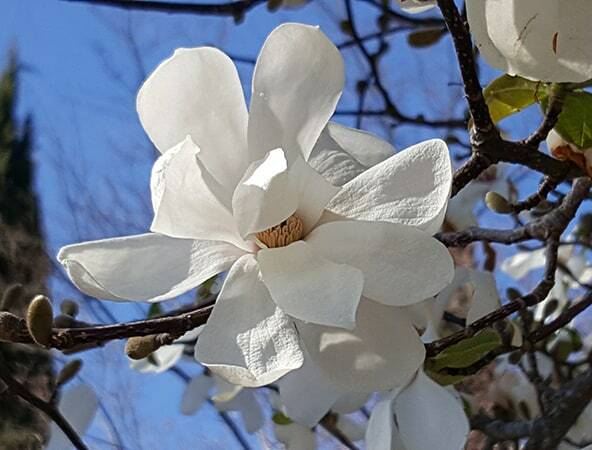 Star magnolia wafting a fabulous fragrance. 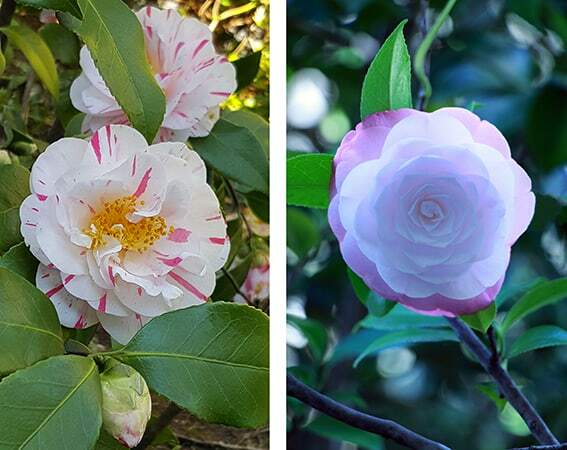 Around the corner was a camellia bush covered in beautiful pink blooms that gradually changed in tone from soft pastel pink centers to deeper edges. 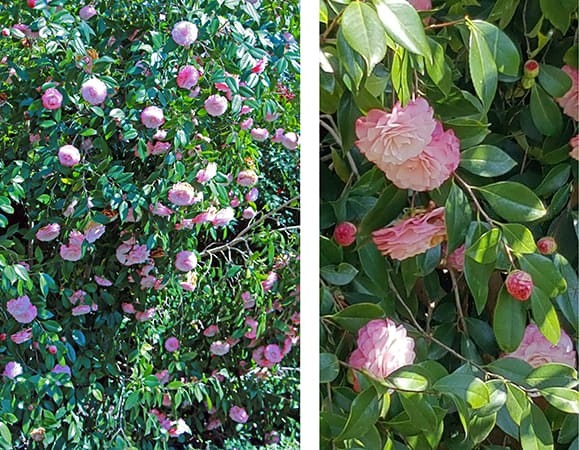 Pink camellia bush loaded with blossoms. 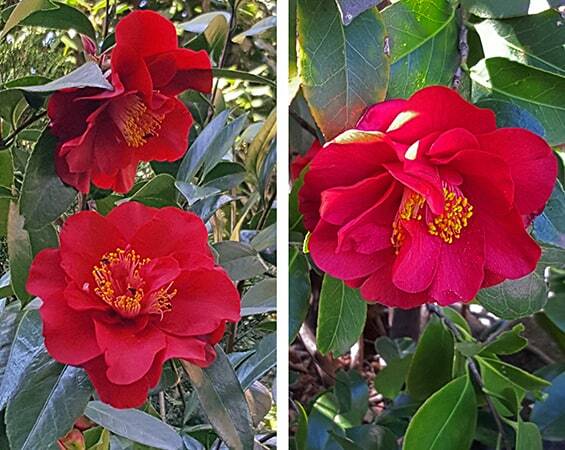 A shade garden in another area featured more camellias with spectacular flowers alongside Pieris japonica shrubs with their delicate chains of tiny blossoms in creamy white and rosy red. 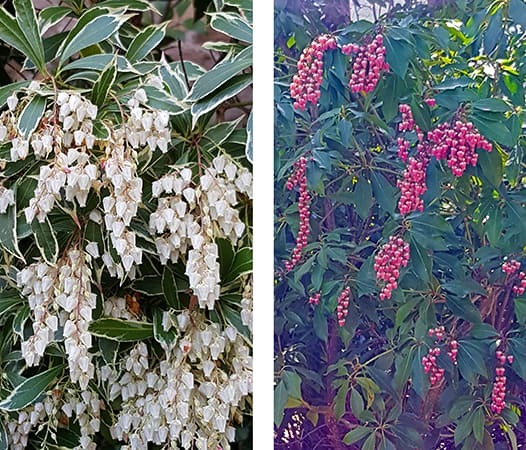 Pieris is an evergreen shrub that does well in shade and is sometimes called Lily of the Valley Shub because of the shape of the flowers, but Pieris is actually in the heather family (Ericaceae). 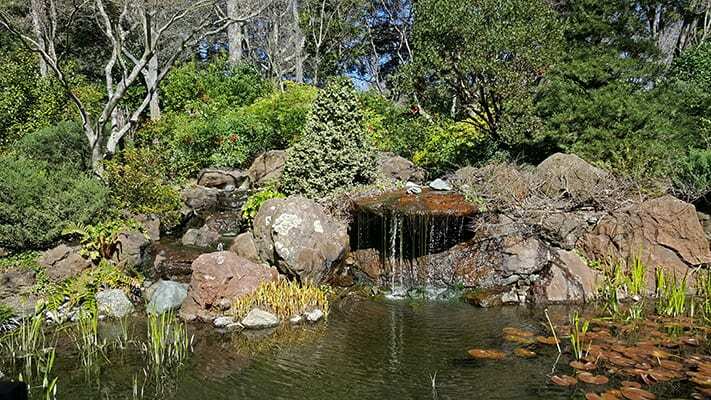 In one area of the garden, a meandering path takes you to a pond with lily pads, waterfalls, and Japanese maples that will look glorious when in leaf (they had not leafed out yet in this early spring image). Pond with waterfalls and stream. 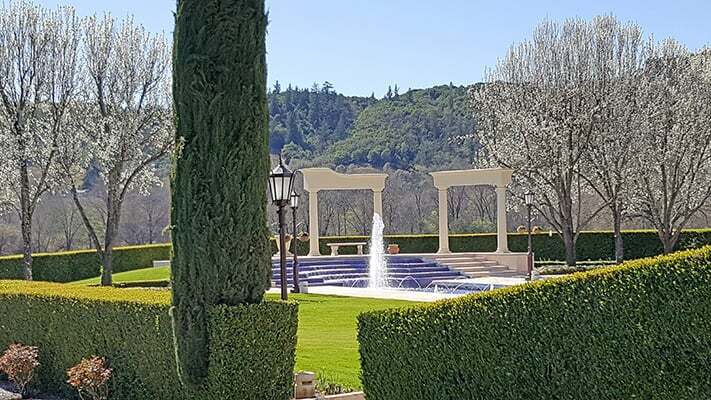 At another end of the garden, in view from the tasting room patio, is a grand, formal fountain. We did not walk down to that area, but there are paths to enjoy the fountain up close. Spectacular fountain surrounded by flowering trees and hills in the background. A building near the shade garden holds large wine storage tanks and wine barrels. The doors were open for visitors to look inside. You’ll have a beautiful drive on Dry Creek Road to get to Ferrari-Carano Winery. If you have time, another gorgeous spot to visit in Dry Creek Valley is Preston Winery. They farm organically and produce, in addition to wine, olive oil, sourdough bread, apples, stone fruit, vegetables, nuts, and grains. They also raise chickens, sheep, and pigs. Ferrari-Carano is located at 8761 Dry Creek Road in Healdsburg and is open daily for wine tasting and enjoying the garden. 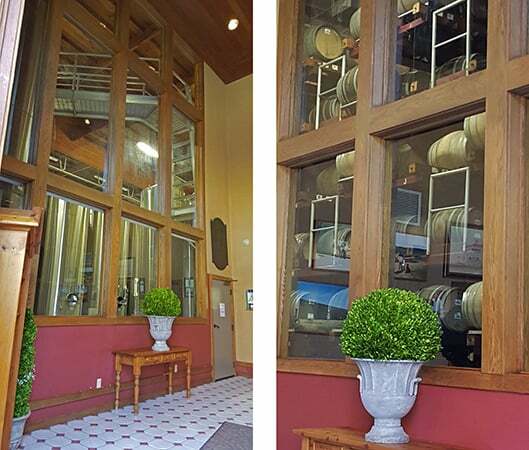 Preston Winery is located at 9282 West Dry Creek Road in Healdsburg and is open daily 11 am to 4:30 pm. You’re almost in my neck of the woods! I’ll have to check out the winery–come on over to Ironstone vinyards–beautiful gardens and delicious juice! 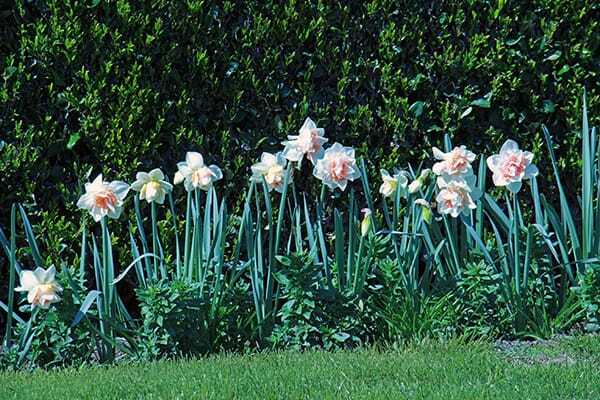 Loved your photos, and the creamy peachy daffodils (I have some in my backyard too). Thanks! I’ll have to try to visit Ironstone someday; sounds fun and the website looks beautiful. Enjoy your spring daffodils!